Two days until pub date! Before that is upon us, I wanted to share my five fave finger knitting projects from Knitting Without Needles. Arm knitting projects bring the drama, but it’s the finger knitting projects that I’m most excited about. 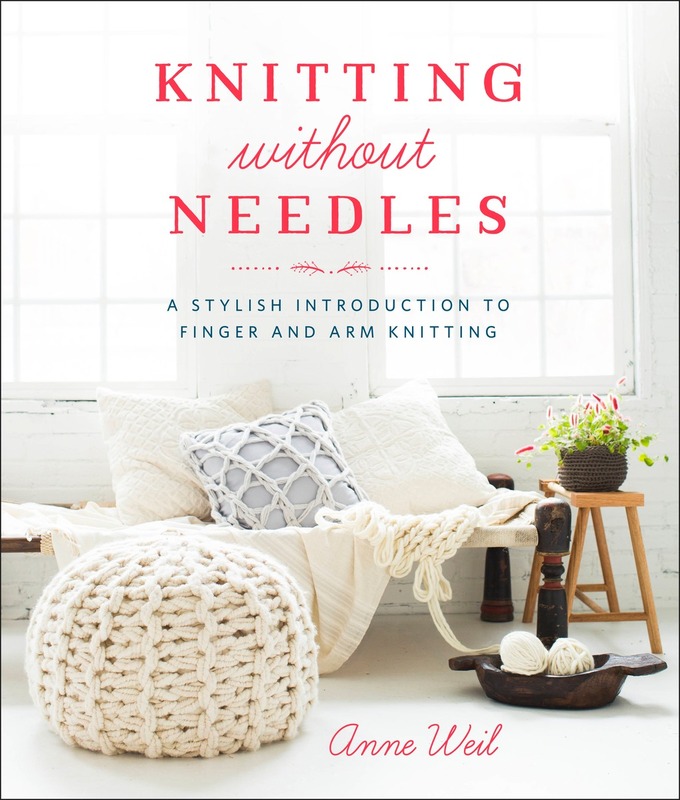 The book includes huge innovations in finger knitting (I know that sounds like an oxymoron, but it’s true!). My intention with this book was to bring finger knitting from a kindergarten craft to the making masses. Whether you are a fabulous knitter or one that has struggled with yarn crafts it in the past, you can do this! Anyone can learn how to finger knit (it’s easy! ), which means that anyone can learn how to make these gorgeous projects. Yes, that means your six year old can make something fabulous, but you can too! Plus, if you order the book today or tomorrow, you can still receive the video and two bonus patterns. In the book, I introduce three simple techniques which show you how to take a single strand of finger knitting and transform it into a beautiful full fabric without sewing! I call it attached finger knitting. These techniques are all done while you knit. In the book, I show you exactly how to in step-by-step photographs, so it’s a breeze to follow along. 1. Finger Knit Baby Booties Aww! I love these. I’m so proud that humble finger knitting can create something so darling! I love the embroidery thread details, too. Wouldn’t you love to give these to a special mama at your next baby shower? What an original and gorgeous gift! These are finger knit on top with a blanket stitched felt sole. Too adorable for words. Here it is on Ravelry. 2. Finger Knit Woven Rug This project is fabulous because it uses a lot of finger knitting in a beautiful way. 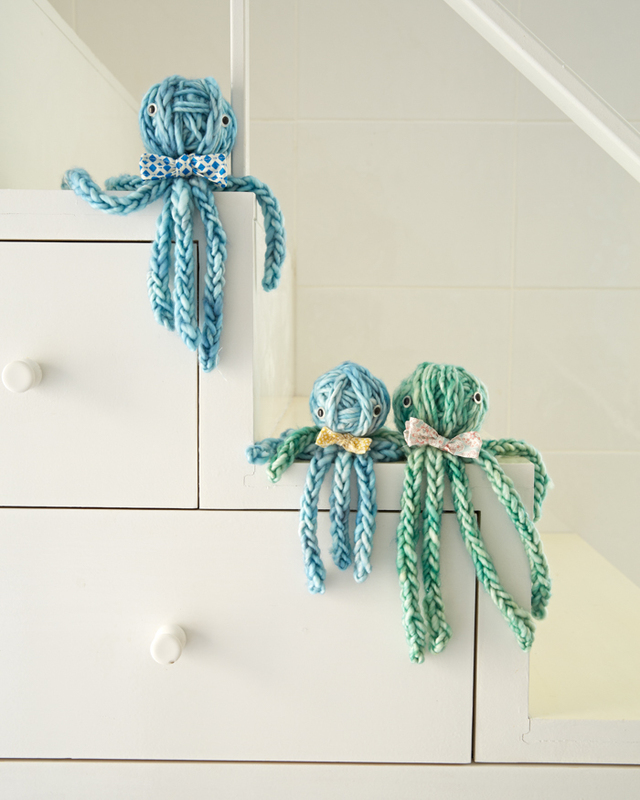 How fun would it be to buy yarn you like and work together your kiddo on this project? The result is so squishy and fabulous, and the result will be something you made together! If you want to see it on Ravelry, it’s here. 3. Finger Knit Cashmere Scarf. 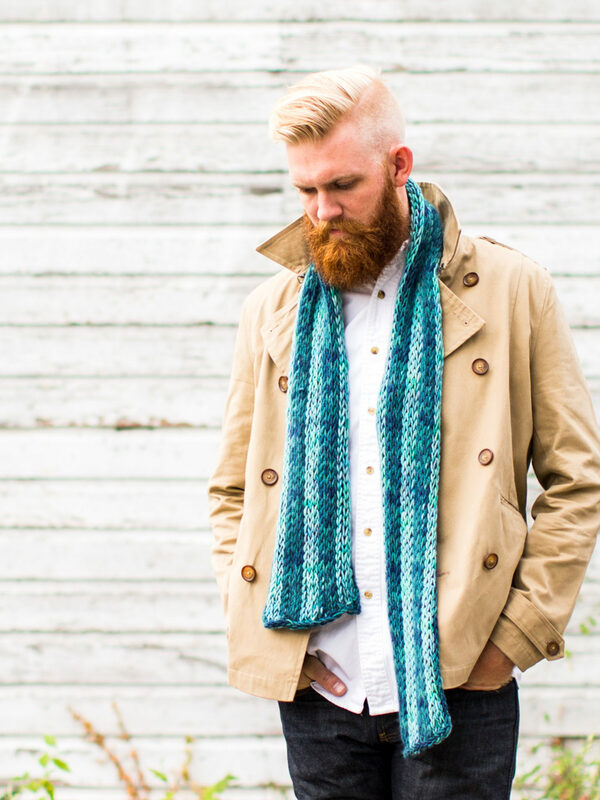 Create this scarf by attaching rows of finger knitting to one another as you finger knit. I show you how step-by-step in the book. It has a simple finger knit border to finish it off. I love the look. My guy loves the feel, light and cozy. You can find details about it on Ravelry here. 4. 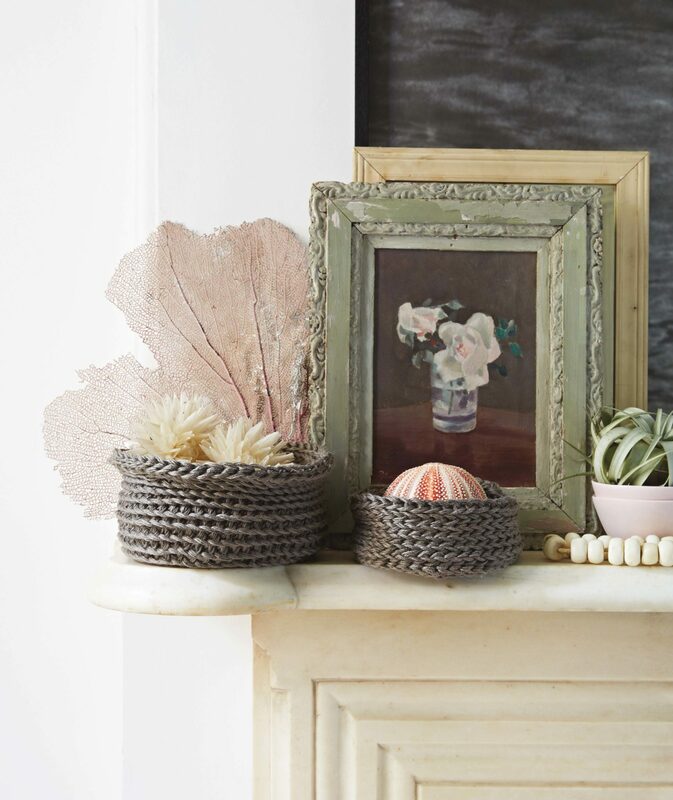 Finger Knit Linen Baskets. These finger knit baskets are so much fun to make and watch take shape! This technique is done by attaching finger knitting in a spiral. It is easy to learn. I love how it is reversible. See above how both sides look amazing! Details on the pattern on Ravelry here. 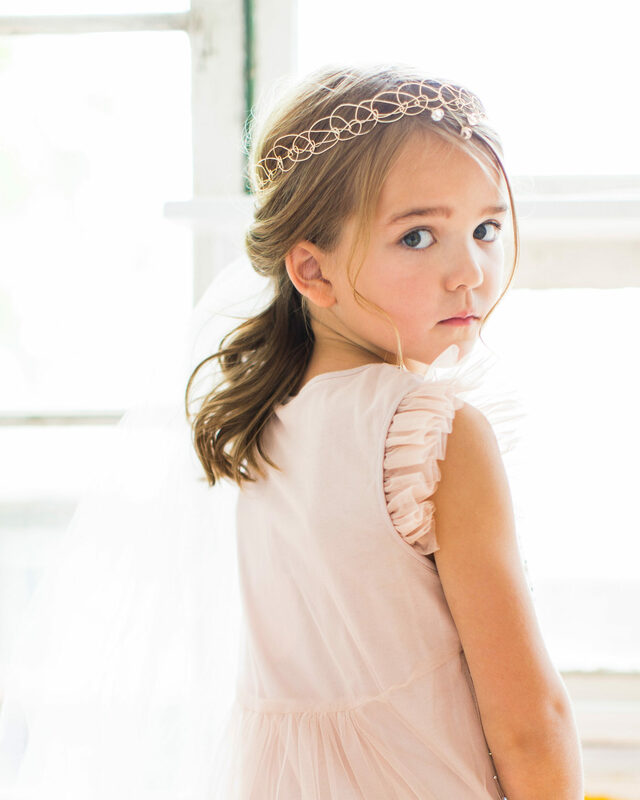 Okay, okay, I couldn’t narrow it down to five – I love this finger knit princess crown! What girl wouldn’t dream of all sorts of fantastic adventures with this on? Finger knitting projects with wire added incredible dimension and structure to the pieces. 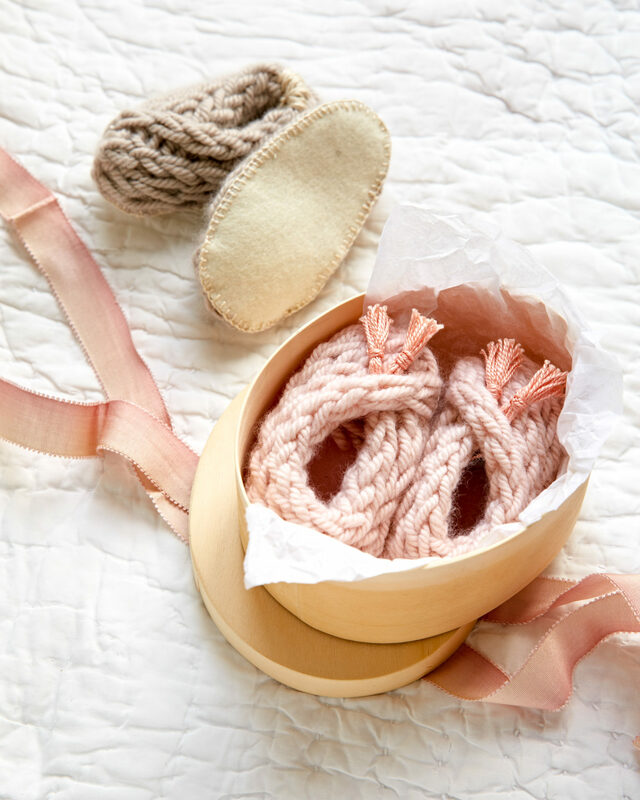 In the book, you’ll find other great finger knitting home decor projects, like a finger knit word wall hanging, a giant monogram, a stool cover, and a book nook. There are fun things like a jump rope, a dog collar and bows, plus two stylish necklace projects! And, don’t forget the amazing projects, too. So, go order Knitting Without Needles now, while you can still get the bonus. It’s super on sale right now, too. You definitely want the video tutorial where I show how to make this hat and to get the two bonus projects. Just send your receipt to knittingwithoutneedles (at) penguinrandomhouse (dot) com. Two days, it’s hard to believe! Almost there . . .
Beautiful projects, styling and photography! I am so excited to get this book and expand my crafting skills. I have to admit that I was skeptical about ever wanting to arm or finger knit (being a traditional needle knitter) but the projects that you have highlighted here are so gorgeous and have me curious about the different techniques involved in creating them. Can’t wait! Thank you so much Tien! You are exactly the kind of maker I am trying to reach! I am a traditional knitter too but I think these techniques are so much fun to work with. I really appreciate your taking the time to let me know and tell me your story! I hope you enjoy the book! Can’t wait to get your book, Anne! I love the looks of these different projects! I can’t wait to see the book. I know it will be stunning, just like everything on this blog! I love your new book! So fresh, modern, innovative, creative & just downright pretty! thanks so much! I love your description of it – this comment makes me happy!! 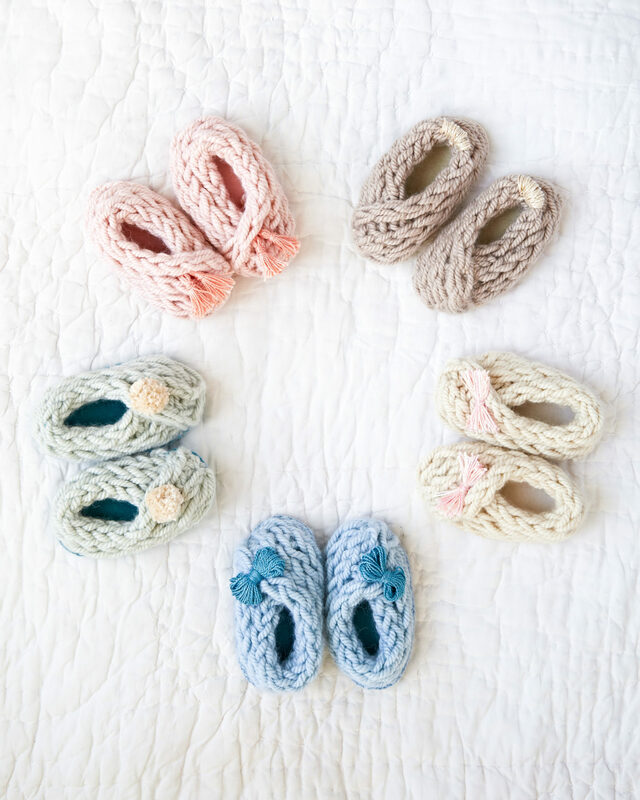 I love these – particularly the baby booties. Would it be possible to size them up for adult slippers? Looking forward to ordering the book! Hi Anna! Thanks so much for your comment. I love the booties, too! And, you are not the first one to ask for them in adult size. I’ve added it to my to do list! Love those booties! Are any of these project patterns actually on Ravelry? I clicked on the link and only found descriptions, but no actual patterns. Does one have to buy your book to get them? I received my book last week and am addicted already to the finger knitting! One thing though – I absolutely cannot work out how to perform the “forefinger join” that’s necessary for the baby booties…I’ve been searching google for video tutorials, but there doesn’t seem to be anything at all out there that’s mentioned that term; could it also be called something else? I’m completely stuck and would love to have my booties ready for my sister’s baby that’s due at any moment! Any help would be so greatly appreciated, many thanks for the Uk! Hi Sophie! I’m so sorry you’re having trouble! I’m happy to help you. I do not have a video at this time. The reason you can’t find it online elsewhere is that I invented the technique. 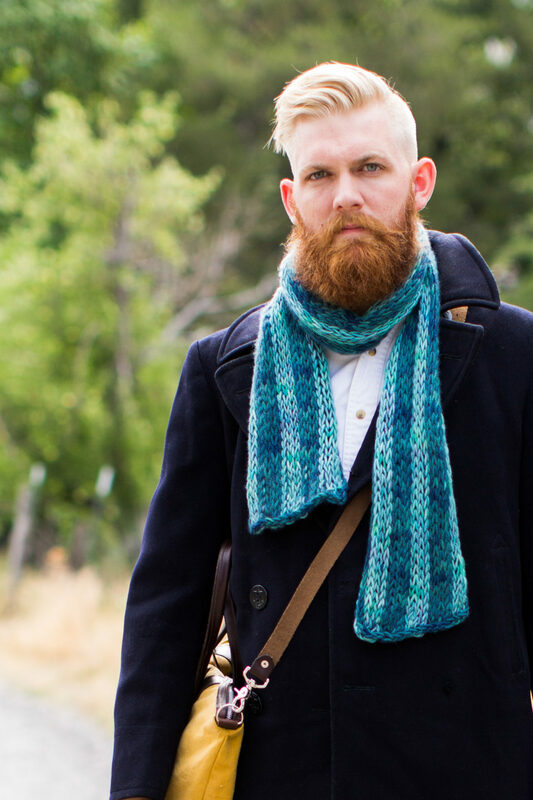 The first thing I would suggest would be to also look at the scarf and doll blanket tutorials in the book as these both also have a forefinger join. If you still have trouble, email me at flaxandtwine at gmail dot com, and I’ll help you further. I will add it to my list to do a video tutorial for this, but I’m not sure about how soon it will be! I want you to have those booties in time though! !